With English lessons from Native English speakers, Music and Swimming lessons from specialist teachers, and a variety of others including art, writing, sports, and literacy, the children of a standard English class experience a range of activities. Within our literacy program we look at Hiragana, Haiku, Dictionary usage and more. With a Native English speaker as a support teacher, all of these things are done within an environment where English is an integral part of the class. Junior students practice lots of simple and useful language. From greetings to the weather, they learn lots of things that are relevant to their lives each day. They also start to learn the ABC’s through songs and simple games. Phonics is introduced in junior class to help them learn in the future. The intermediate lessons expand on what the children learned in Junior. 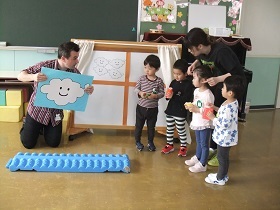 The children study short and complete sentences through roll playing real life situations and games. Simple phonics are taught at this level, so the children are able to identify the letters by their sounds. Senior students practice more complicated phonics, including constant pairs and vowel combinations, along with learning to spell simple words. They learn to make and use longer sentences to express themselves and hold simple conversations. They also practice reading and writing words and short sentences. In the same style as the immersion classes, a few times a month the standard classes get the chance to spend the whole day in English. A native English speaking teacher runs the class for a day, not just one activity, but their entire routine. In a complete flip to normal, the support teacher is their usual class teacher. 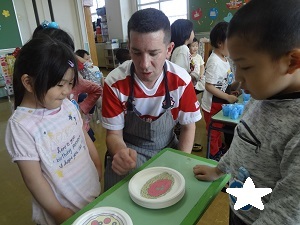 The standard classes are all supported by at least 1 native English speaker. 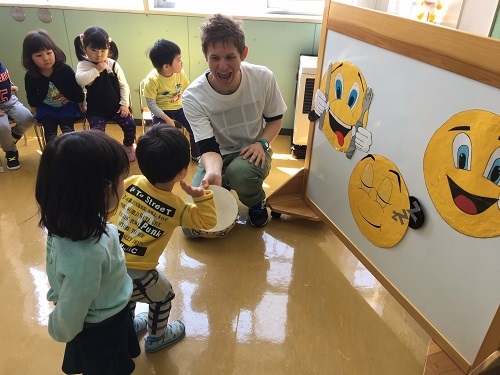 This means that even though they are doing things with their Japanese teacher, they are constantly listening to and given the opportunity to converse with a native English speaker. The teacher reinforces the language they have studied in class and also exposes them to even more useful English.